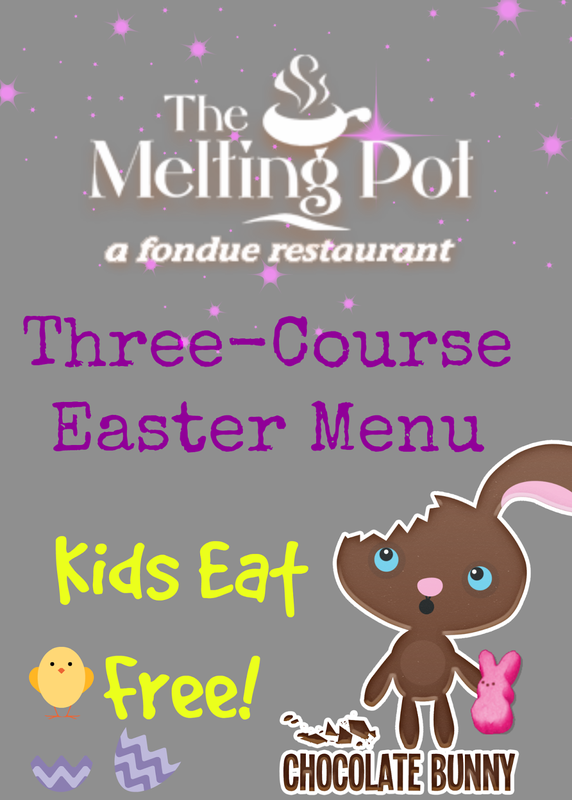 The Melting Pot is celebrating Easter in a BIG way – KIDS EAT FREE and all four-Atlanta area locations will open at NOON! Hippity Hoppity Fondue’s on its Way! Celebrate the start of spring with an EGG-ceptional Easter lunch starting at noon on Sunday, April 5 at The Melting Pot! Enjoy a three-course fondue experience including your choice of creamy cheese fondue, savory entrée and every bunny’s favorite chocolate fondue. What makes this deal so EGG-cellent? The Easter Bunny will be hopping around and hiding treats for guests at each table. Post a photo of your family with the Easter Bunny on Facebook (tag Melting Pot Atlanta!) for a chance to fill your basket with gift certificates for future fondue fun! Our creamy cheese fondue to share. Your choice of Classic Cheddar, Traditional Swiss, Spinach and Artichoke, Fiesta or Wisconsin Trio cheese. Includes Filet Mignon, Shrimp, Teriyaki-Marinated Sirloin, Boneless Breast of Chicken and Fresh Fish accompanied by homemade dipping sauces and an array of fresh vegetables. Court Bouillon cooking style included. Share your choice of any one of our luscious chocolate fondue desserts served with a variety of fresh fruits and cakes – and specialty Easter treats! Priced at $29.99* per adult. Children under 12 will receive a complimentary child's entree with the purchase of each adult three-course menu. Additional children are priced at $15.99. Space is limited - make your reservation today! *Prices do not include tax and gratuity. Please no sharing. Not valid with any other offer, discount or certificate. This is offer is valid at the four Atlanta-area Melting Pot locations on Sunday, April 5 only. See store for details and restrictions.